If you want to achieve a picture perfect shave every time, you need warm water, a sharp razor, and a quality shaving cream. Shaving cream can help reduce skin irritation, nicks, cuts, and razor burns. Best of all, using a luxurious shaving cream can help improve your morning routine, making it an experience you look forward to every day. Shaving cream, foam, or gel can be used by men and women, on the face and body. It makes the area moisturized and prepped for a clean, close shave. Shaving cream can be applied with a shaving brush, or with your fingers. You only need a thin layer to achieve the desired results. Most shaving experts, including the Men’s Health experts, recommend shaving cream over gel or foam because most shaving creams don’t foam, but instead glide on the skin. 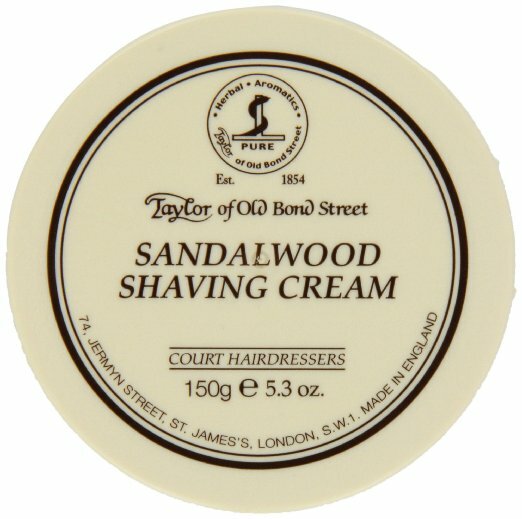 Taylor of Old Bond Street Sandalwood Shaving Cream Bowl is Amazon’s #1 best seller in shaving creams, as well as one of top rated and “most wished for” items on Amazon. It is backed by outstanding reviews, including nearly 2,000 five-star reviews on Amazon. This professional-quality shaving cream will moisturize your skin while preparing it for the closest shave ever. It comes in a round plastic bowl with a screw-on top, which makes it the perfect gift. The bowl helps to make the lathering easy, especially if you use it together with a shaving brush. It produces a rich lather and thick texture, which makes it ideal for use with any razors, even straight razors. The rich, masculine sandalwood scent has a woody blend of exotic sandalwood and cedar, along with lavender, rosemary, jasmine, and rose. 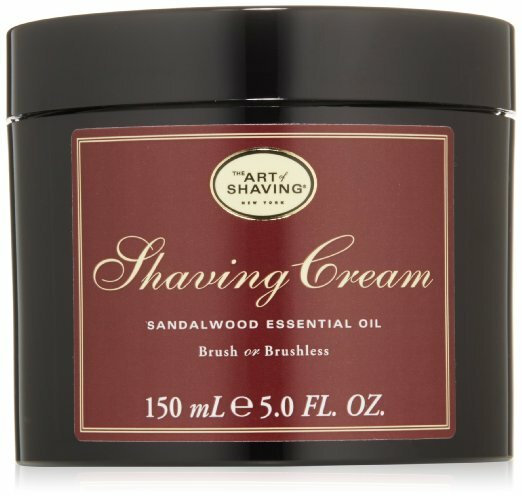 The Art of Shaving Shaving Cream includes four elements of the perfect shave, and this Sandalwood shaving cream is one of the essential products for the simple four-step process. The cream uses natural ingredients, glycerin, coconut oil, essential oils, and moisturizer to soften the skin. The rich formula creates a heavy foamy lather that will improve razor glide, soften the beard, and lift stubble for a close shave. It protects the skin from irritation and razor burn, and will leave it feeling soft and smooth. The rich cream creates a good amount of lather and can provide a really luxurious morning experience if you use it along with a shaving brush. It is ideal for all skin types, free from synthetic dyes and alcohol, and can be used with any type of razor, including a straight razor. The masculine sandalwood scent has woody Indian sandalwood, but if you don’t like the scent, you can also choose from lemon, lavender, ocean kelp, and unscented versions. 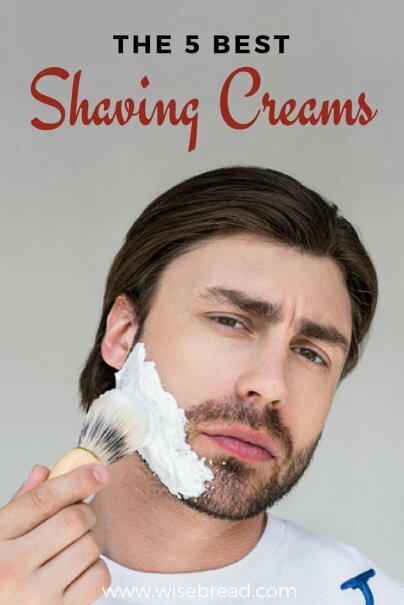 It is one of Men’s Journals top picks, one of Amazon’s best sellers, and one of the top recommended shaving products online. The Proraso Shaving Cream is ideal for all beard types. The eucalyptus and menthol formulation will give your skin a tingly experience, leaving it feeling refreshed and toned. The concentrated, creamy formula is paraben-free, contains no artificial colors, and has eucalyptus oil, coconut oil, and glycerin to soften the skin. The refreshing cream creates a rich lather to prevent nicks, cuts, and razor burn. It helps tighten pores and will ensure a close, comfortable shave, so you can enjoy the softest skin yet. This shaving cream has been the Italian barbers’ choice for more than three generations. It is also one of Amazon’s best sellers, top rated items, and “most wished for” items. There are a number of bestselling items from the Proraso brand, so you are sure to find something that is right for your skin. The Kiss My Face Moisture Shave is a natural, paraben-free, phthalate-free, SLS-free, preservative-free, and cruelty-free shaving cream contains olive, coconut, and lavender oils, Golden Seal, lemongrass, shea butter, and antioxidant-rich pomegranate to effectively improve the condition of the skin every time you shave. The 4-in-1 shaving cream nourishes with natural healing, antiseptic botanicals, vitamin E, natural oils, and aloe vera to soften, smooth, and moisturize the skin and reduce shaving irritation. The thick lotion consistency will protect your skin during your shave and leave it feeling soft, smooth, and moisturized once you are out of the shower. You simply emulsify the thick cream between your hands before spreading it on your skin. The pomegranate grapefruit variety smells refreshing and clean, but the shave cream comes in a range of scents, if this one isn’t your favorite. Kiss My Face Moisture Shave is incredibly affordable, but don’t let the price fool you. This drugstore favorite has many of the same ingredients as the most expensive creams on the market, and can be expected to work just as well. It is the top rated shave product on MakeupAlley, one of Men’s Journal’s top picks for shaving creams, and one of Amazon’s best sellers. Many reviewers agree that this is the best shaving product for men’s faces, but it can also be used anywhere on the body. The Neutrogena Men Skin Clearing Shave Cream will speed up your morning routine because it is clinically proven to improve the condition of your skin every time you use it. The skin clearing oil-free formula has glycerin and moisturizers to form a protective barrier between your skin and the razor. This helps reduce skin irritation, fights razor bumps, and minimizes ingrown hairs. The no-foam formula rinses clean and won’t clog your pores, leaving behind softer, smoother, healthier skin. It is one of Amazon’s best sellers and because it is a twin pack, it offers an incredible value. And don’t let the low price fool you. This has many of the same ingredients as the most expensive creams on the market, and can provide professional-quality results. And those are our recommendations for the best shaving creams. As always, be sure to check Wise Bread's Buying Calendar to learn when and how to buy just about anything!